One definition of heroine, according to my dictionary is “a woman who is admired for great or brave acts or fine qualities.” Note the word brave; it is crucial. This admirable book intends to acquaint readers with scores of women who have not been celebrated enough in sports history for their brave acts and fine qualities. They include athletes in various sports, coaches, promoters, sports broadcasters, sportswriters, and others. 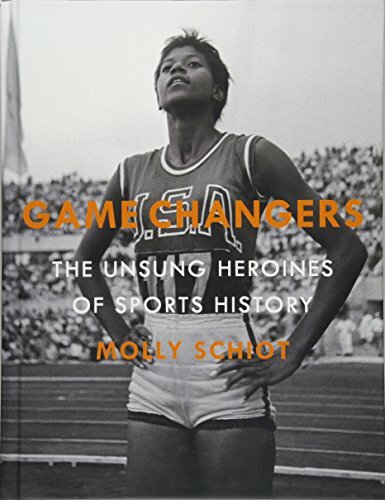 What is unusual about Game Changers is that the author, Molly Schiot, neither an expert nor an academic, first documented these heroines by posting photos each day on her Instagram account. For those Instagram followers, the hardcover, large-format book will be permanent coffee-table remembrance of the project. For others it is an eye-opening introduction to female sports achievements that too often are forgotten to quickly or barely recognized. There are a few ringers among these unsung achievers: Billie Jean King, Pat Summitt, Abby Wambach, Babe Didrikson Zaharias. In her introduction, without naming them, Schiot says she has included certain women who changed the direction of their sport. For every tennis heroine like Billie Jean, there are so many others, like Evonne Goolagong Cawley (can she truly be unsung now? ), Alice Marble, and women’s tennis promoter Gladys Heldman, who happily are in this volume. For every Summitt, there are others included like Kay Yow and Cathy Rush. Some of the stories told the book could make terrific movies, as stories about male athletes so often are. Take Louise Stokes and Tidye Pickett, for example. If this were a fair world, they would have become the first African American track stars, since they were runners who qualified for the 1932 U.S. Olympic team in the 4 x 100-meter relay. But at the last minute the Olympic Committee replaced them with white runners. In 1936, Pickett was almost as much a rebuke to Hitler at the Berlin Games as Jesse Owens when she became the first African American woman on the U.S. team, running the 80 meter hurdles. She did not win, but sometimes winning isn’t everything. And Stokes? She became a pro bowler. Game Changers also expands its “unsung” premise to cover the pioneering magazine womenSports (another Billie Jean King initiative), the Wake-Robin Golf Club (the oldest registered African-American women’s golf club in the U.S.) and Rep Edith Green, the legislator whose hearings in Congress led to Title IX. That amendment blew open the gym doors and mandated gender equality in school sports. In a few cases, Schiot includes entire teams, such as the 1964 Japanese volleyball team which started a run on Olympic medals that lasted for four summer games; the Tennessee Tigerbelles, the state university team that included sprinter Wilma Rudolph. Omissions: There are several motorcyclists pictured, by no bicycling champions such as France’s Jeanne Longo. There are no snowboarders such as Karine Ruby. There are no “keepers of the flame”—Rachel Robinson would have been an obvious choice. A final quibble: Thoroughbred fillies are athletes, so how about Ruffian? Regardless of its shortcomings Game Changers continues the important archival digging shown in the wonderful Game Face published in 2001 by Jane Gottesman, At the bargain price of $25, Game Changers makes the perfect gift for a fan, a friend, a school library . . . or a kid who is forever at a playground. Grace Lichtenstein is a former New York Times reporter, an author, and a book reviewer for such outlets as the New York Times, the Washington Post, TheMillions.com, and NYCityWoman.com.